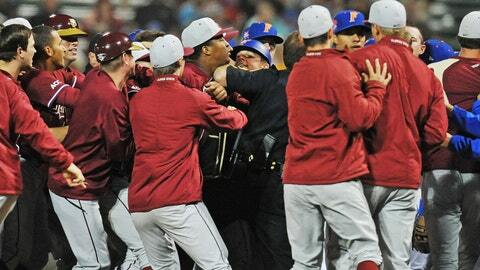 Jameis Winston, at center left, is held back by a sheriff's officer as Florida State and Florida players scuffle in the eighth inning Tuesday night. Heisman Trophy-winning quarterback Jameis Winston was involved in a benches-clearing brawl during a Florida State-Florida baseball game Tuesday night in Jacksonville. The incident began when Florida State left fielder D.J. Stewart hit a slow roller up the first-base line and collided with Florida pitcher Danny Young while trying to beat it out. The collision prevented Young from making a play on the ball. After Stewart touched first base, Gators first baseman Zack Powers went face-to-face with him, then Stewart shoved back, instigating the full scuffle. Beyond that photo, details of Winston’s involvement are lacking. The Times-Union write-up says only that Winston was "included." Powers, Stewart and Young were all ejected and there was no word on the potential for any further discipline. The Gators went on to win the game. Powers, Stewart and Young were all ejected and there was no word on the potential for any further discipline. The Gators went on to win the game 4-1, holding off a ninth-inning rally by the top-ranked Seminoles, which began with a home run and a single. According to the T-U, after the game, Florida State coach Mike Martin Sr. had an interesting choice of words in talking about the toughness his team showed in the rally. He spoke of his team’s toughness between the base lines, but it could just as easily apply to the scrum. "There’s no doubt that the testosterone and the adrenaline kicked in. Those men are very strong and very active," Martin Sr. said. "The hands got a little quicker. The motivation rose. Just very proud of our baseball team, and the way that we fought. We certainly didn’t back down from anything, and that makes every Seminole proud, because that’s what we’re about."